When I did my big Steam backlog playthrough I saved all the games that I had a positive impression of so that I could swing back around to play them later. I've started doing that a bit with Wolfenstein and now with Super Time Force Ultra. 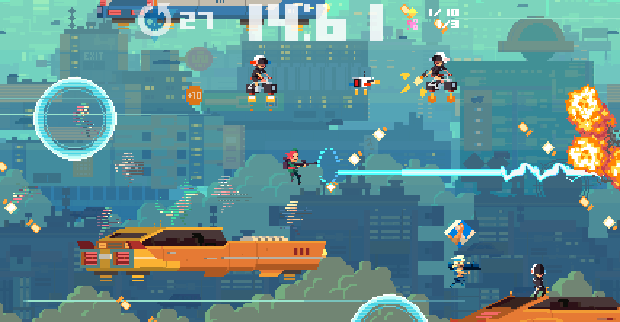 Super Time Force Ultra is a time traveling game where you never truly die, you just choose to rewind time and try again. But instead of your old self disappearing, it persists. This means that on some bosses you'll have 30 copies of yourself all attacking from different angles at the same time. It gets chaotic but it's super fun. The game is full of humor too. The reasons for missions are often along the lines of, "Wouldn't it be cool if the dinosaurs weren't extinct? Let's go stop the meteor from wiping them out and see what happens." Philosophy and consequences of time travel are nowhere to be seen, but it's better that way. They make it work and they make it funny. I finished the game the other day and completely felt like it was worth my money. I have no problem recommending it. You should really see this action platformer in motion. I'll embed a video below for your viewing pleasure.